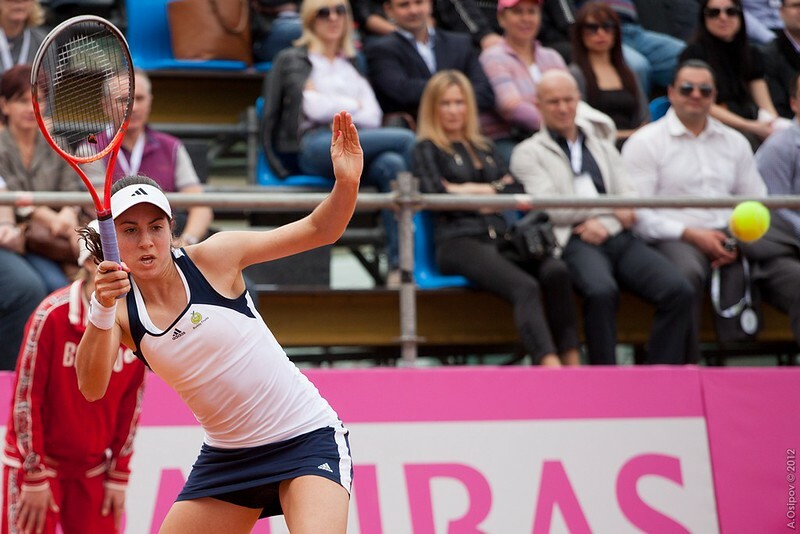 After a difficult 2013 when injuries and the recovery from mononucleosis held her back, Christina McHale is finally bouncing back in this 2014, looking as determined as never before. A small injury slowed her preparation for Wimbledon, as in the last training session before the ITF event of Nottingham, she slipped during sprints, falling heavily on her hand, which did not let her play for a couple of days. The healing took a few days, but she managed to compete the following weeks, coming to Wimbledon with a bunch of matches played on green. Having proved to be an all-round player with several good performances in each slam and on every surface, the girl from New Jersey has her worst wins-losses ratio on grass. “I mean, I think part of the reason is ‘cause there are not many tournaments on grass,” she explained: “So I feel like by the time I get really used to it, it’s over. Since that 2012 when she reached the third round in three consecutive slams, she had been struggling with a serious form of mono, that seemed to arrest her improvements. “It was tough…it’s really like something some people don’t really realize, that once you actually get over it, then the time you need to get back in full strength takes a long time,” she said with a slightly trembling voice, a sign of how hard it has been for her. And the difference is that this year she came very close to capturing her very first WTA title, as she reached her first final in Acapulco, losing in three sets to Australian Open runner-up, Dominika Cibulkova. “ I think I’m getting closer, that was definitely a very close match, it was a really good week for me,” she acknowledged. Not only the first title is coming closer, but her old habit of upsetting big names –she has wins over Victoria Azarenka, Caroline Wozniacki and Svetlana Kuznetsova- is about to come back too, as testified by her match against Maria Sharapova in Madrid, when she was a break up in the decisive set. “I definitely took a lot away from that match even though I lost,” she admitted: “It was disappointing. But it reassured myself that I can compete against the top girls, and it gave me confidence and in my next matches in Rome I carried that over. After her big battles this year and the surprising results of many up and coming youngsters at Roland Garros, more and more players believe that beating the top names is not impossible after all. “I think, when you see someone, you know, like the top seeds pulling out against players that are around my age or that I’ve played against. So you think, if they can do it, then I can do it too. So it’s really inspirational to see them doing such things,” she said. Moreover, the new wave of American youngsters doing well is a great support. But it is not just a matter of training, there is also a good relationship that grew stronger with the years. Around the world is very common for players whose native language is not English to communicate with coaches in that language, but not so for the 22 year old, who speaks a beautiful Spanish during the changeovers. Despite the young age, she has had a great deal of experiences, but there is one that so far is her most memorable. So after a look back, it is time to look ahead and what lies in her future plans. “I mean, I definitely would… I want to try and win a WTA tournament, that would be a good goal for me.” She admitted: “But I mean, if I just keep on working on the same way I’ve been working, just really focus on what I need to improve and get more power in my game, things like that.